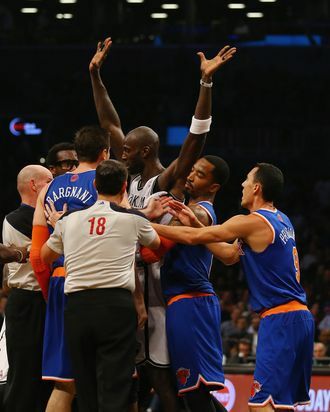 Andrea Bargnani #77 of the New York Knicks and Kevin Garnett #2 of the Brooklyn Nets are separated after an altercation during their game at the Barclays Center on December 5, 2013 in the Brooklyn borough of New York City. NOTE TO USER: User expressly acknowledges and agrees that, by downloading and or using this photograph, User is consenting to the terms and conditions of the Getty Images License Agreement. They still have one of the league’s worst records, but the Knicks got a much-needed morale boost last night by demolishing their intra-city rivals, the Brooklyn Nets, 113-83. The Knicks ran up the score early, and passions were running high: Iman Shumpert and Andray Blatche had to be separated, Andrea Bargnani and Kevin Garnett scuffled, and Bargnani was later thrown out of the game for trash-talking Garnett (poor Kevin!). “I don’t understand Italian,” Garnett told reporters after the game. “I wasn’t speaking Italian,” Bargnani says.